Yavalath is a board game with extremely simple rules, but an emergent twist that makes it interesting and fun to play. It came about as a result of the following question: can computers invent board games? 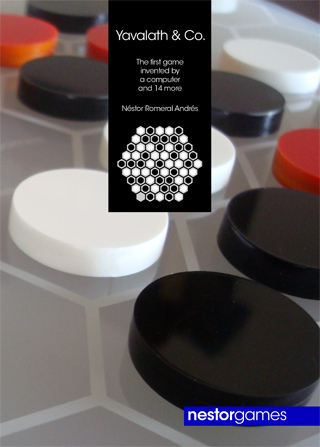 This book features 15 games that can be played with a Yavalath set, including Yavalath itself. A Yavalath set consists of a hexagonal board of 5 hexes per side, 30 black stones, 30 white stones and at least 25 red stones. Grab some friends and a Yavalath set, and have some fun! You can also download the free PDF here or purchase it from Lulu.com. This book is part of the Apocalypse Pack!